The TV commercials tell us, “It’s that time of year again.” If you are experiencing cold or flu symptoms, try healing with herbs and immune boosting foods at the onset of symptoms. Here are some healing recipes and ingredients to keep on hand during cold and flu season. Find some relief by embracing healing herbs and foods that heal the body. Check out this video on how to make elderberry syrup with Mountain Rose Herbs. 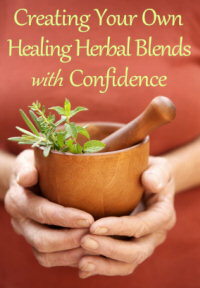 Also, discover which herbs you could use for cough relief and a brief explanation of why they are effective. To learn more about Lana’s cough remedy and other herbal remedies, enroll is Lana’s online herbalist course. If you’ve a common cold, flu, headache, or upset stomach, sip some ginger tea for healing. An easy recipe: cut a ¾-inch piece of fresh ginger root. Peel the brown skin off and chop. Steep a teaspoon of chopped ginger root in a cup of boiling water then sip. You can also drink this healing tea before a trip to avoid motion sickness, or sip to calm a queasy stomach or menstrual cramps. Ginger has many healing properties including anti-inflammatory properties that are said to lessen the pain of rheumatoid arthritis. To your health! 2 shitake mushrooms – organic dried. Can pre-soak per package instructions. Boil the water in a small pot. Add chopped vegetables and mushrooms to boiling water. Lower heat, cover, and simmer until vegetables are tender (about 8 -15 minutes depending on the vegetables used). After vegetables have simmered for about 5 minutes, place a ¼ cup hot vegetable broth from the pot in a separate bowl. Add miso to bowl and mix until miso becomes a wet paste. Add tofu to bowl of miso mixture and set bowl aside until vegetables are tender. Tear seaweed into small pieces and add to the pot. When vegetables are tender, add the miso mixture from the bowl to the pot. Let stand for 3 – 4 minutes. Don’t heat miso on high heat, as it will kill the living microorganisms that aid in digestion and healing. Ezine includes holistic articles, meditations and special offers. Miso soup is great to help you maintain good health and to recover from ill health. Miso soup has long been known for its healing effects. A smooth and dark puree, miso is made from soybeans and has many health benefits. Miso soup is even thought to deter cancer cells from multiplying. This recipe also includes shitake mushrooms and seaweed, both considered powerful immune system boosters. One teaspoon of seaweed daily is said to boost the immune system. If you’re feeling under the weather, you might want to muster the energy to make this miso soup recipe yourself. Trust your body to guide you to the nutrients it needs for healing and health. Remember making this healing soup is intuitive. You can try more or less miso and different vegetable combinations. Honor your body’s wisdom as you experiment with this miso soup recipe. We hope you enjoy these healing recipes! This entry was posted in Nutrition and Healing Recipes and tagged become a herbalist, foods that heal the body, healing with food, herbal course, herbal training, herbalism course, herbalist training, herbalist training online by June Cook. Bookmark the permalink. When trying to lose wiehgt, share. Restaurant meals can contain an enormous amount of calories. If you split your meal with someone you both? can consume less calories. You can even put one-half of your dish in a restaurant to-go container as soon as it’s served, or ask your server to do it before it’s even brought out. Either way, you’ll only eat half of what is served.